CB Supplies carries a variety of quality Copper Tee Drill Headers. 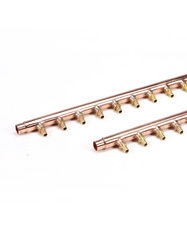 Our copper tee drill headers are available with various inlet connections including male, female, plain end and PEX crimp. Outlet connections are offered in PEX crimp, compression and copper sweat. The inventory includes custom prefabricated 1″ pipe run with 2, 3, 4, 5, 6, 7, 8, 9, 10, 11, 12, 13 and 14 loop outlet configurations. We also inventory 72″ long headers which can be cut to the desired length in 1″, 1-1/4″, 1-1/2″ and 2″ pipe run diameters with either 1/2″ or 3/4″ sweat outlet connections.